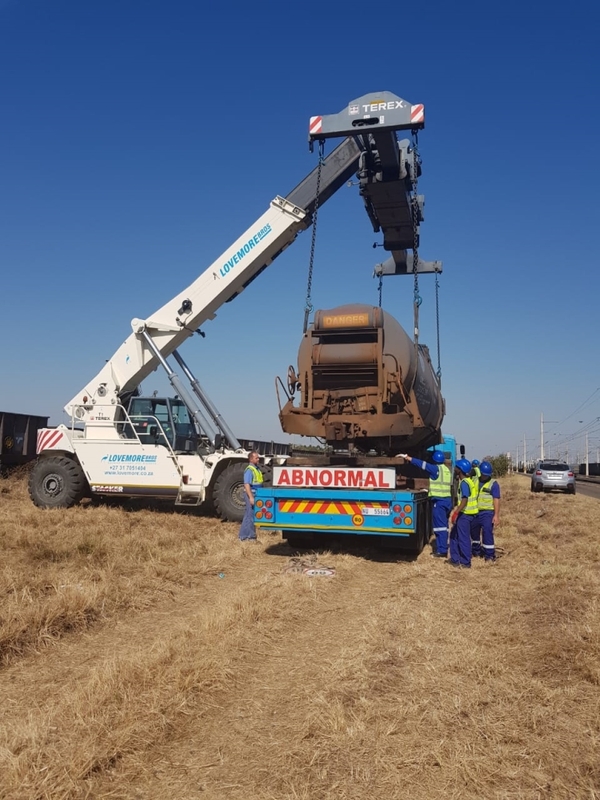 LOVEMORE BROS Richards Bay had the opportunity recently to rig and load 2 x 24ton tank wagons, that had derailed, onto LOVEMORE BROS trucks and transported them to Transnet Freight Rail in Germiston for repairs. Our team in Richards Bay used their 45t reach stacker to load the damaged cargo effortlessly. On arrival in Germiston Hitech Freights were notified by the client that there was no crane available for offloading, Andre Schutte, Director from Hitech Freight, contacted Peter Lovemore from LOVEMORE BROS in Johannesburg who acted speedily and had a crane on site and off loaded the tanks within 3 hours.